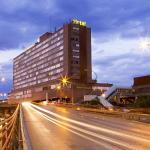 Room service, free water and Wi-Fi and a Chamartin spot add comfort to the non-smoking Ilunion Pio XII. At the six-story Ilunion Pio XII, guests enjoy one of 214 non-smoking rooms complete with free Wi-Fi and bottled water along with plasma TVs, hairdryers and a pillow menu. Guests can dine in the on-site restaurant or order room service. There's also a business center for checking in on work. Ticket, car rental and tour service information is available at the hotel. Parking is available. Ilunion Pio XII is in the northern Madrid, less than six miles west of IFEMA and within one mile east of the Chamartin metro station. A half-mile stroll also leads to the Bambu, Duque de Pastrana and Pio XII metro stops. For lovers of Spanish bullfighting, Las Ventas is less than a 10-minute drive south of the hotel. Madrid-Barajas Airport is eight miles east. When looking for a comfy spot with free Wi-Fi near IFEMA and multiple metro stops, our guests book their stay at Ilunion Pio XII.